Following we’ll explain the different materials used for hard or soft shelled luggage. Hard sided luggage is usually more durable and offers more protection for fragile items placed inside. They are rigid so don’t usually allow for expansion or squeezing in the extra item. A downside might be the tendency to show scuff marks more easily and sometimes even dents. The most used and popular materials for hard case luggage are polycarbonate, polypropylene, acrylnitrile-butadiene-styrene (ABS) and aluminum. The word polycarbonate is a compound of polymer (synthetic organic materials such as plastic and resin) and carbonate. This simply means polycarbonate has properties of both those materials. It is basically a synthetic with the ability to be easily molded into different shapes. Due to its transparency it can also very easily be made into different colours and/or patterns. It possesses another two highly desirable qualities for the perfect hardsided luggage material: it is highly impact resistant and very lightweight. Apart from that it also features a high temperature resistance and even when dented is able to be put back into its original shape. There are different grades which are used to make luggage, such as grade A, which is 100% newly made polycarbonate and grade B and C, which are both recycled polycarbonates. Recycled polycarbonate is made from pellets or ground polycarbonated items and re-made into another product. Polycarbonate is commonly used to make bulletproof glass, CDs, safety glasses or goggles and helmets and visors. NASA was one of the first to use polycarbonate for their helmets and visors in 1955. If you choose a quality polycarbonate luggage piece you will get something that is made out of one of the strongest materials luggage can be made from. Some of the higher grade polycarbonate luggage items can come with a higher price attached to them, but they are well worth it due to their high durability and impact resistance as well as their extreme lightweight. and it doesn’t react with either water, detergents, acids nor bases, which prevents it from breaking down too easily. For all those reasons it is mainly used for films, fibers or as moulding materials such as for luggage. You will find it used to make microwave containers, hinges, car bumpers; even in medical tools or cold weather gear worn by soldiers. And of course it is widely used in food packaging. Samsonite has used polypropylene to create two new materials for their luggage and have taken it to another level. An ultra strong material was created by using the fibers of durable polypropylene and weaving those together, thus changing them into separate sheets. Those sheet can easily and quickly be reinforced and then fused together to take the shape of an outer shell for a suitcase. This new material is called Curv, which is exclusive to Samsonite for their luggage. The other new material Samsonite have developed is called Flowlite. As you might have guessed, it’s extremely lightweight. And, as all Polypropylene material, it is also known for its shock resistance and strength. Due to its high density of colour pigments, stress whitening won’t happen easily to anything made of Polypropylene. Flowlite is lightweight due to its very thin moulds, yet has a strong shell and will protect your personal belongings inside your suitcase. ABS is a thermoplastic material, which is very easily used in injection molding manufacturing and 3D printing due to its low melting point. It can be recycled many times and a common way to produce it is to make it from ABS plastic. Price-wise it falls somewhere between polypropylene and polycarbonate. It is relatively inexpensive and widely used, such as in your keyboard keys, the housing of your power tools and in LEGO toys. ABS is not as resistant as polypropylene but strong enough to protect belongings inside your suitcase. It is usually used in the lower price range of suitcases and other luggage and not quite as great in terms of long-lasting and great looks. Luggage made of ABS can still be great in terms of functionality and certainly in terms of price. If you want to read up more about ABS, take a look here. Aluminum or aluminium luggage is usually made of a combination of materials which is called aluminium magnesium alloy. This tends to be extremely durable and resilient, as well as lightweight. This material doesn’t easily dent and it’s shock resistant, which means your belongings will be safe on the inside. 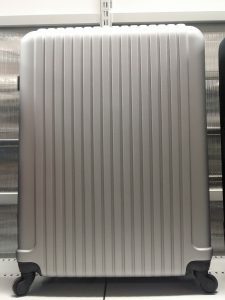 Aluminum luggage is also very easy to clean and has a unique look about it, which also makes it easy to find on the luggage belt. Rimowa for example, uses either aluminum or polycarbonate to produce their luggage from. They state that their aluminum magnesium alloy suitcases also have naturally occurring corrosion resistant qualities and are fully recyclable. Due to its high quality, aluminum luggage usually comes with a higher price tag. It is sure to be long lasting though and it looks extremely stylish. Materials for soft sided luggage might be more familiar to you, as many of the materials are also used for clothing and other day-to-day items and you might have seen the name of the material written on a care instruction tag. Common materials are: Polyester, nylon such as ballistic nylon or cordura, canvas and leather. Always keep in mind to check the denier rating of some of the soft materials, as this will tell you a lot about their durability. The higher the denier rating, the thicker, heavier, stronger and more durable the material will be. Between 500 and 2000 denier count is a good range for larger luggage as well as more frequently used luggage. Remember though that the higher the count or rating, the heavier it will be. Soft case materials are many times more prone to dirt and stains, therefore it is always a good idea to research how to clean them. Nylon fabric was first released in 1940 and straight away, production was increasing. In 1940 alone, 1300 tons of nylon fabric were produced; a whopping 64 million pairs of stockings made of nylon were sold during this first year alone. Nylon was first marketed to be durable and indestructible and therefore sold for nearly double the price of silk stockings. The demand for nylon stockings was so high in 1946 that production couldn’t keep up and this led to the so called Nylon Riots. It has been reported that at one time roughly 40000 people waited in line to purchase 13000 pairs of nylon stockings. 80% of the world’s nylon went into production of stockings and lingerie in the 1940 and early 1950s. But soon after people realised that pure nylon came with some problems. I’m sure if you’ve ever worn stockings, you’ll have had the odd “run” or “ladder”, which could only be fixed by using nail polish. Am I right? The solution to nylon’s problems was to blend it with other existing fibers to make it stronger in terms of elasticity and durability. This blending also enabled it to be dyed in more colours. Which brings us to our current nylon-blend fabrics used in luggage. Nylon certainly is the strongest material when deciding between polyester, canvas, leather and nylon made luggage. It is more durable than polyester, as well as more expensive than polyester and canvas fabric, but less pricey than leather. As follows you can see the differences between ballistic nylon, cordura and polyester. Ballistic Nylon was also created very early on during WWII and as the name gives away, it was intended for protective gear, i.e. to protect from shrapnel, bullets and other ballistic impacts that could occur to aircraft personnel. Cordura is a collective name for fabric technologies, which can be used for many different products including luggage and backpacks. If you want to find out more about the different options for Cordura fabric, have a look at their website. They can explain their fabric technology much better than I would be able to, apart from summing up the different qualities above. Always check the denier rating of the fabric as it will tell you a lot about the durability. The higher the denier rating, the thicker the fabric, which means it’s heavier, stronger and more durable. Keep in mind though, that nylon fabrics are always a better quality than polyester. 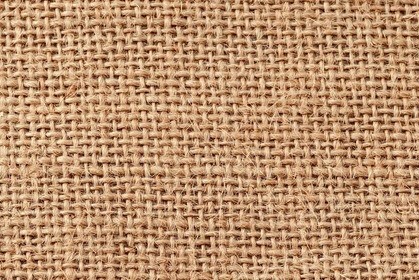 Canvas traditionally was made from hemp, flax or similar yarn and produced a strong and coarse unbleached cloth. Modern canvas is different in that it is usually made from cotton or linen. There are two different types of canvas, plain and duck (from the Dutch word “doek”, translating to linen canvas). The difference between the two is that duck canvas is more tightly woven (two yarns woven together in the warp, single yarn in the weft). The more commonly used duck canvas is made of cotton and you can find it in sneakers to tents to canvas bags and luggage. 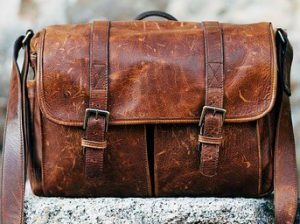 Canvas luggage is usually waterproof, as when the fabric gets wet the weave swells up and seals against moisture coming in. Leather is a strong, durable and flexible material which is created by tanning animal rawhides; these are mostly from cattle which is also raised for their meat. Try to get high quality leather, usually called full grain leather or just genuine. The thicker the leather, the longer it’ll last, but the heavier it might also be. Better quality leather will also look the best and age well compared to using lower quality or thinner leather. Full grain leather usually will have been stamped, sanded and painted. Lower quality leathers, such as suede and splits, are usually heavily treated to simulate a higher quality, full grain leather. Remember to check the care instructions for all of your hard and soft sided luggage as mentioned above, but especially the softer ones, as they tend to stain more easily. I hope this’ll help you decide which luggage material is best for you and your needs. This is very informative! I love my hard case luggage.. Aside from its durability, it is not very light. I also feel I need to be able to put more on it. So I might look into something lighter, such as the ballistic nylon as it seems very durable too and it will fit more in. Thanks! You’re welcome! There are so many great choices, but knowing what the characteristics of the materials are, helps a lot to decide. If you’re looking for something light, the ballistic nylon definitely is a great choice. So much great information! I have to say it is very confusing when walking into a store for a suitcase of one to pick. We are taking our vacation next summer, so I have been looking here and there at the different types. I love the idea of the hard shell except for the fact there is no forgiveness when trying to squeeze it into small compartments. I had no idea that they made nylon suitcases and that was kind of fun to hear the story of the stockings. Do you have a brand you would suggest for a polycarbonate suitcase? There are just so many choices these days and it’s easy to get confused with all the options available. Yes, I do have a suggestion: the Samsonite Cruisair! 100% Polycarbonate, ultra-protective and stylish! Thanks for your description & embedded video of how Samsonite’s polypropylene is formed into making suitcases. We’re looking to replace our old suitcases and wondered about replacing with this type of manufacture. We were initially worried whether polypropylene is robust enough to survive baggage handling at airports, however, watching the video satisfied our curiosity. It’s impressive how resin innovation has evolved in the way they manufacture polypropylene granules and weave them into substantially strong & stylish suitcases. Any suggestion for a polypropylene suitcase? Yes, it was very impressive finding out about how it all evolved over time and how very strong some of the materials really are. Yes, I have a suggestion: Samsonite Black Label Cosmolite Spinner It is made with the Curv technology. Extremely lightweight and stylish!